Since it’s 3:30am and I can’t sleep, I though I’d show you guys a picture of my newly-organized fiber room. I got some gridwall panels with 12” pegs and hung up all the fiber that was previously stored in plastic bins & drawers. My skeins of sock yarn and dyed top can now flow freely in the breeze air conditioning. Even the carded batts hang nicely with a peg speared through the middle of the roll. I am considering participating in a couple of fiber festivals next year (DFW Fiber Fest in Dallas or Kid ‘n’ Ewe near San Antonio). In order to do that, I need something more professional looking than plastic bins to display all the merchandise I plan to bring. And since my “stock room” (spare bedroom) shelves were bursting at the seams, this seemed like a good excuse for the gridwall purchase. Seeing it all on display like this makes me want to have a brick and mortar store so other people can come in and marvel with me. 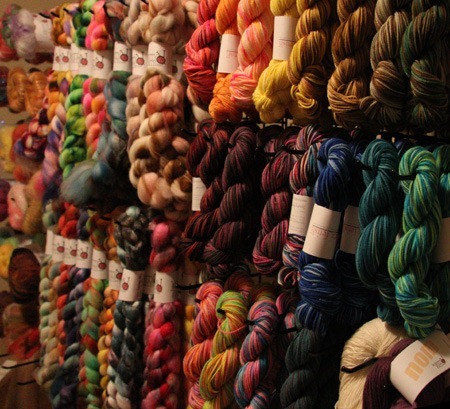 Houston has several yarn stores, but we really need a good spinning fiber shop in this neck of the woods. The closest one is near Galveston, I think. One afternoon while daydreaming, I even looked up the cost of retail properties around here. As suspected, they’re still way out of my league. I’d have to quadruple my current monthly sales before I could afford it. Note to self: figure out how to quadruple monthly sales. Last year I built a contraption (ok, I designed a contraption and my husband built it for me) to wind long-repeat self-striping yarns, and it was a disaster. It worked for about a week and then all the parts started falling off, stretching out, and generally causing knots, tangles, and tears of frustration. My new mill was worth every penny, and so far it’s been hassle free. It’s fairly large, but it spins easily. 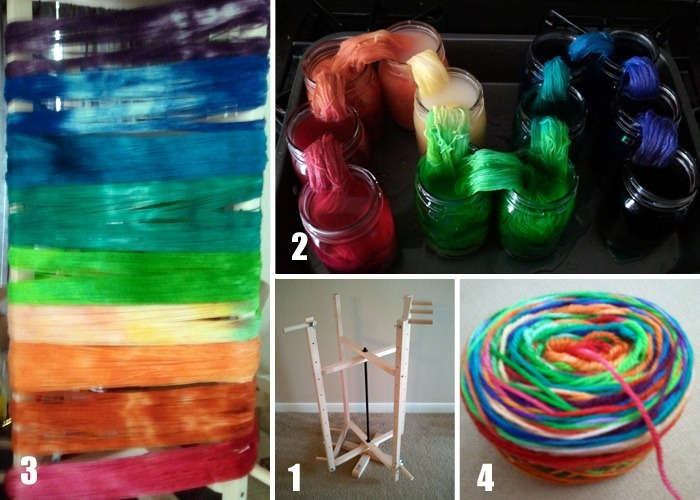 You just wrap the yarn around the post at the bottom, spin the mill while gradually moving the yarn up, wrap it around the post at the top, and go back down again. The more wraps, the longer the skein, and therefore the longer the stripe repeat. This colorway took about 10 wraps. As pictured above in my test-sock, you’ll get approximately 1.75 rounds per color. (Test sock: adult size small, knit on US #1’s.) There are 14 repeats (pink-to-pink) in each 105 gram ball. It was a lot of work, but I’m very happy with the results. 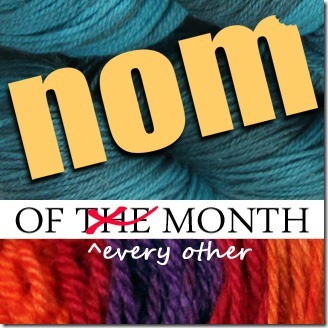 I predict I will continue making self-striping skeins of Nom in the months to come, especially now that the Nom of the Month clubs will force me to invent a minimum of 12 new colorways per year. p.s. 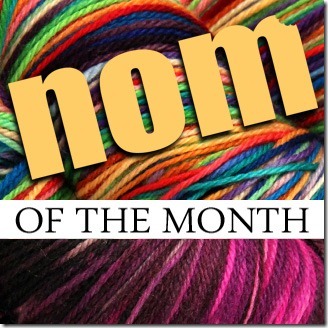 visit the NOM page on Ravelry to add it your stash and rate it!